Semintra Oral Solution is an oral solution that has been specifically designed for cats to reduce the amount of protein lost in their urine. Used for deduction of proteinuria associated with chronic kidney disease in cats. Losing too much protein in the urine is associated with a shorter life expectancy in cats suffering from chronic kidney disease. View Semintra Oral Solution Drug Facts Sheet. Dosage & Administration: Always provide the Client Information Sheet with each prescription. The initial dose of SEMINTRA is 1.5 mg/kg (0.68 mg/lb) orally twice daily for 14 days, followed by 2 mg/kg (0.91 mg/lb) orally once daily. The dose may reduced by 0.5 mg/kg (0.23 mg/lb) increments to a minimum of 0.5 mg/kg (0.23 mg/lb) orally once daily to manage SEMINTRA-induce hypotension. SEMINTRA can be administered directly into the mouth, or next to or on top of a small amount of food. Do not mix into food. SEMINTRA should be administered using the dosing syringe provided in the package. The dosing syringe fits onto the bottle and has 0.1 mL incremental marks. The dose should be rounded to the nearest 0.1 mL. After the administration closes the bottle tightly with the cap. Rinse the dosing syringe with water and let air dry. If the cat vomits within 30 minutes of dosing, the cat may be re-dosed. Always provide the Client Information Sheet with each prescription and review it with the cat owner. Advise cat owners that adverse reactions can occur with use of SEMINTRA. The most common adverse reactions reported during the field studies included vomiting, diarrhea, lethargy, weight loss, anemia and dehydration. CONTRAINDICATIONS: Do not use in cats with a known hypersensitivity to telmisartan. CLIENT INFORMATION SHEET: contains important about SEMINTRA. Please read this information before you start giving SEMINTRA and review it each time the prescription is refilled as there may be new information. This sheet is provided only as a summary and does not take the place of instructions from your veterinarian. Talk with your veterinarian if you do not understand any of this information or if you want to know more about SEMINTRA. What is SEMINTRA? 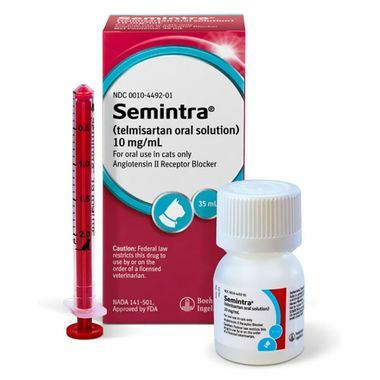 SEMINTRA (telmisartan oral solution) is used to control high blood pressure in cats. What should I tell my veterinarian about my cat before starting SEMINTRA? Tell your veterinarian about other medications your pet is taking, including prescription drugs, over the counter drugs, heartworm preventatives, flea & tick medications, and vitamins and supplements, including herbal medications. Tell your veterinarian if your cat is pregnant, nursing, or you intend to breed him/her. Tell your veterinarian if your cat has any other serious health conditions, anemia (low red blood cell count), vomiting or diarrhea, decreased appetite or weight loss. What are some of the possible side effects of SEMINTRA? Like all drugs, SEMINTRA may cause side effects, even at the prescribed dose. Serious side effects can occur, with or without warning, and in some situation result in death. Contact your veterinarian immediately if your cat develops a medical problem or side effect while taking SEMINTRA. The most common side effects which can occur with SEMINTRA include vomiting, diarrhea, lethargy, weight loss, anemia (low red blood cell count) and dehydration. There are other side effects which may occur. For a complete list, ask your veterinarian. How do I give SEMINTRA to my Cat? SEMINTRA should be given to your cat in their mouth (orally) or next to or on top of a small amount of food. Do not mix into food. Follow your veterinarian's instructions for how much and how often to give SEMINTRA. 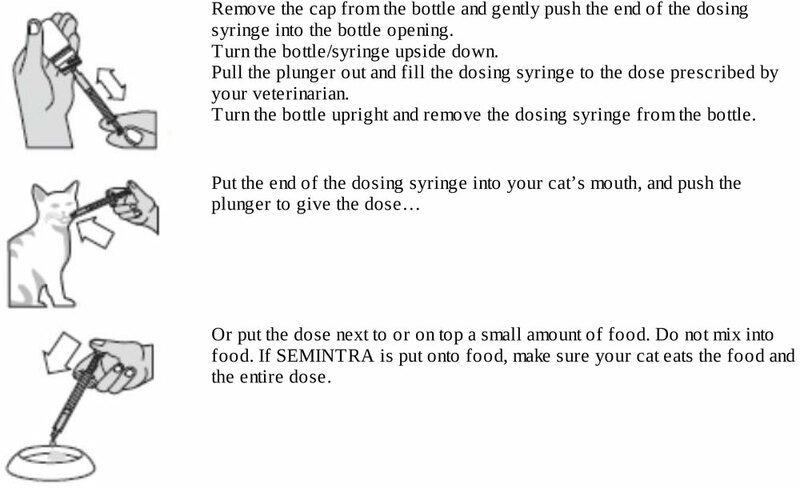 Give SEMINTRA using the dosing syringe provided in the package. The dosing syringe fits into the bottle opening and has 0.1 mL marks to use for measuring the dose. If your cat vomits within 30 minutes of giving the SEMINTRA (telmisartan oral solution) dose, your cat can be given the same dose again. If your cat vomits more than 30 minutes after giving SEMINTRA, do not give SEMINTRA again until the next scheduled dose. After dosing, replace the cap on the bottle and close tightly, Rinse the SEMINTRA dosing syringe with water and let air dry. What should I do if my cat gets more than the prescribed amount of SEMINTRA? Your cat may develop low blood pressure or other side effects. Contact your veterinarian immediately. HUMAN WARNINGS: SEMINTRA is not for use in humans. You should keep SEMINTRA in a secure storage area out of the reach of children. Pregnant women should avoid contact with SEMINTRA because other similar drugs have been found to harm the unborn baby during pregnancy. If SEMINTRA is accidentally ingested, contact a physician, It is important to show the treating physician a copy of the package insert, label, or client information sheet. SEMINTRA is an angiotensin II receptor blocker. This client information sheet contains a summary of important information about SEMINTRA. For more detailed information about SEMINTRA, talk with your veterinarian.